Behind the scenes at Tommy Hilfiger, the 33-year-old preppy American fashion brand is drastically shaking up the way its collections are being sold to department stores, shifting away from showrooms full of physical samples to a 'digital showroom' model which better resembles the way consumers are accustomed to shopping for clothes online. Speaking at Couchbase's Connect EU conference in London, Anne-Christine Polet, senior vice president of digital at PVH Europe, the European arm of the clothing company which owns Tommy Hilfiger, Calvin Klein and other iconic brands, said: "The fashion industry is an old one. Business has always been analogue and has been done via backroom deals, it's a bit old school." 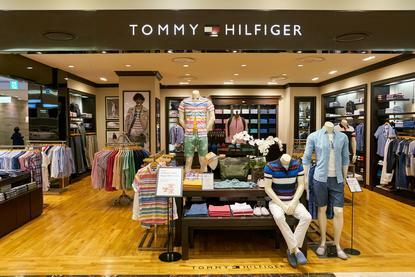 Driven by Daniel Grieder, CEO for Tommy Hilfiger Global and PVH Europe, this outpost of the fashion giant started to rethink a core part of its business: the way buyers from department stores, like Selfridges or Harvey Nichols, select and purchase items to sell on to their customers. Traditionally these buyers would visit a physical showroom, browse the new collection and put in an order with PVH. For PVH this encompasses two brands (CK and Tommy Hilfiger), each with roughly eight sub-brands, each selling 1,500 pieces of clothing every quarter. "So if you do the math, that's a lot of product to create just to sell to a department store, to then produce, to sell to a consumer," Polet said. Starting four years ago, from its office in Amsterdam, PVH Europe assembled a small team of IT people and a specific 'digital transformation team' to drastically reimagine this process, making it more efficient and sustainable for its Tommy Hilfiger brand. Polet and her team started by sitting in the company's showrooms for a couple of weeks to gauge how its salespeople were working with customers. "They were building their assortments on the floor with physical samples, someone would come and buy something and they would go to lunch and do it again with a new customer," Polet said. "So we mapped it out and presented them with a concept of a digital way of doing things." It's safe to say that the salespeople on the showroom floor didn't appreciate the intrusion. She received responses that ranged from: "You will never, ever, take away my samples" to "if you do this to me I will leave the company". Relatively unfazed, Polet pushed on: "We kept on going and put something in front of them, and maybe from the 25 people we spoke to there were two that said 'maybe'. "So we took those guys and said what if we change this? Or build this? And without even knowing what Agile software development was we actually started to do this iterative way of working ourselves, because we knew that what we were creating was so far away from what they were used to doing that we just had to get them on board." This approach eventually bore fruit when the first digital showroom launched in 2015. "What we have developed since has been a major breakthrough for everything we do," Polet said. "Not just from a people perspective but from a technology perspective." In practice the workstations within the showrooms look like jumbo tablets, with whole collections displayed on 3M monitors and HD 4K screens, with product details and pricing, buying history and delivery dates available with a single click, as well as instant email confirmations for buyers, cutting down on paperwork. When PVH opened its new offices in Amsterdam in 2016 it had two floors of digital showrooms. "Overnight our sales guys had to sell digital," Polet said. "That was a big change." Today 80 per cent of PVH's selling process in Europe is digital, which means a direct 80 per cent reduction in the number of samples they need made, significantly improving PVH's sustainability efforts. As of this month, PVH has 139 workstations across 19 locations in 18 countries, including an expansion to its Calvin Klein brand. The impact doesn't stop there. "It has made such an impact, not just in terms of reputation and how we are perceived within the industry but it has made an impact on our time to market, we have been able to reduce our sell-in time by six weeks, that is unheard of in the industry," Polet said. "We have been able to up the number of appointments we can do per day, our sales are much more accurate and our customers are really happy. "The digital showroom has been a catalyst for us. "Once we saw the potential that digital could bring on a sphere we thought was simply the way that fashion works for wholesale sales, then we realised there is so much more that we can disrupt by leveraging technology in such a way across our entire value chain." Most telling though may be this: "We have the competition calling us asking if they can buy our digital showrooms from us." More on this in just a second. Now PVH is looking to take its newfound digital expertise beyond the B2B selling process and into the way it designs and manufactures garments. "If you think about fashion, product is at the heart of it. Product creation is in essence a cumbersome way of working," Polet said. Running through the current process, Polet explains: "You have to design a product, make a hand sketch, send that via email to a factory in China who will interpret that, you hope, and send back a prototype. “Then that prototype isn't exactly what you wanted so you pin it, send it back and forth until eventually, after three rounds, if you are lucky, you get a product you want. By allowing its clothing designers to build 3D models of garments, instead of hand sketches, and building the capability with manufacturing partners to create prototypes directly from these far more detailed models, PVH hopes that it can cut this process down drastically and further reduce waste. In more practical terms Polet says PVH is currently building a joint venture with an unnamed manufacturing company "to enable design in 3D in a much easier way". This will initially be for PVH "but potentially with the idea to commercialise and have the entire industry benefit from it". The success that PVH has had with its digital transformation efforts has actually led to some pretty existential questions being asked within the company. "We now actually are tackling systematically all those parts of our value chain," Polet said. "So not just B2C, we are now thinking: How do we disrupt our value chain? What if our business models doesn't exist anymore, what would that mean? "What if we were to become a software company?" The idea of Tommy Hilfiger as a tech company is not as ridiculous as it once would have sounded. "Actually we have been going into this direction because of the digital showroom and the immense value that has had for us," Polet added. "Our competitors in the fashion industry have not been able to replicate a tool like this and there has been true interest in our product. "So we have now started what we call a corporate startup, which sounds cool but is really a dedicated tech team to build out the digital selling ecosystem, not just for PVH but to potentially commercialise it in the future. "We really do see that this is the future for us and even though everyone is saying we should become a software company, slowly and very carefully, we are actually trying to become that already."